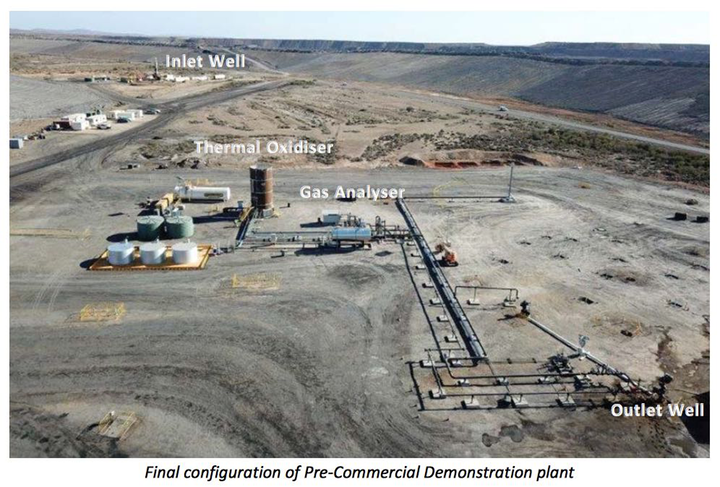 A TRIAL run of underground coal gasification at Leigh Creek has produced commercial quality syngas, albeit at a slow flow rate. In October, the state government gave the controversial project permission to conduct a 90-day, pre-commercial demonstration,�despite opposition from the traditional owners and the Greens. The company involved, Leigh Creek Energy, is now seeking approximately $5 mln from shareholders ”for project development and general working capital”. It has asked the state government to extend the three-month trial period to allow it to increase the syngas flow rate. Leigh Creek Energy �aims to produce up to a mllion cubic feet a day of syngas, a mixture usually consisting mainly of carbon dioxide, methane, carbon monoxide and hydrogen, during the three-month trial. As of January 8, the project had been producing gases continuously for 89 days, and commercial quality syngas for 13 days. Commercial production, if it is given the go-ahead, would aim to produce up to 3 million cubic feet of gas a day (mcfd). South African energy and technology company Africary has been sufficiently impressed with the performance of LCK’s pre-commercial demonstration project so far that it has agreed to lease the equipmenet and ship it to South Africa for its own syngas project, when LCK’s demonstration is complete. The LCK’s eventual aim is to use the gas to make fertiliser. Leigh Creek Energy (ASX code LCK) is appealing to shareholders to provide more cash for its operation by buying shares from the company at 12c each. It hopes that retail investors will throw approximately $3.68 mln into its piggy bank. It has already raised some $1.28 mln from institutional and seriously rich investors. Investors can only buy one new share for every 15 LCK shares they already held on January 11. �The offer closes on January 31. The offer is not underwritten, and the company may struggle to get its money. The shares fell to the 12c offer price following the initial announcement on December 17 and have since dipped as low as 10.5c. Investors will not have to pay broker’s commission on any shares they buy from the company, but they may be able to buy shares more cheaply on the open market. It seems likely, however, that Leigh Creek Energy’s Chinese associates may pick up some or all of any shortfall. LCE’s major shareholder, China New Energy Group,which owns a third of the company, was happy to invest $4.34 mln at 16c a share in July last year. Monitoring data up to the end of November, published on the Department of Energy and Mining website �(www.energymining.sa.gov.au/petroleum/projects/prj_leigh_creek_energy_isg#monitor_data}�showed that sensors around 100 metres below ground have shown no change in temperature or pressure. �Even within 100 metres �of the combustion chamber, temperature has remained constant and the pressure of the gas being produced is below the surrounding hydrostatic pressure. �If there were a leak, water would flow in rather than gas leaking out. In a statement at the start of the trial in October, the company’s managing director, Phl Staveley, said one of the aims of the trial was "to demonstrate that the company could operate the underground gasifier safely and in an environmentally responsible manner". UCG operations have been banned in Queensland on environmental grounds since April 2016. A last-minute application by the�Adnyamathanha Traditional Lands�Association�to prevent the trial going ahead was refused by the Supreme Court� on September 19. "We're very concerned because people live in that area and it's time for healing of the site, not any more destruction," the ATLA's Vince Coulthard said in a statement issued by the Conservation Council of SA. Mark Parnell, leader of the SA Greens, says it was disgraceful that the Marshall government had given the Leigh Creek project the go-ahead. "This is a technology that is so dirty and dangerous that it’s been banned in Queensland following the worst case of pollution and land contamination in that State’s history! �This project is bad at every level – for the climate, for public health, for cultural heritage and for the future.� We know that fracking for coal seam gas is bad, but this is far worse! �"If it's banned in Qld, why is it coming to SA?! "� He asked. Leigh Creek Energy maintains that the geology at Leigh Creek is entirely different from the site of the Linc Energy disaster at Chinchilla in Queensland.� The Leigh Creek coal to be gasified lies between�impermeable�mudstones and is some 500 metres underground, about four times deeper than Linc's operation. Investigations by the Queensland Government and a subsequent court case have shown that things went badly wrong at Chinchilla for a number of reasons.� The coal seam was in effect a fractured aquifer. When, in order to stop water flooding into its combustion chamber, Linc pumped air in at high a pressure, it caused �cracks which enabled noxious gases to leak into groundwater and even escape to the surface.� The whole operation was poorly regulated by the Queensland authorities until it was too late. LCE says very little dewatering of the coal seam will be needed. "The ground is impermeable so water can't flow easily, but a very small amount will come in because we will be operating at a pressure lower than the groundwater pressure – effectively sucking some water in so that potential contaminants can't move away." Love gave the LCE proposals a cautious tick, and specifically compared and contrasted the Leigh Creek and Chinchilla sites. He cited the�Independent Review of Underground Coal Gasification�prepared for the Scottish Government by Professor Campbell Gemmell in 2016. "You might also want to consider whether an eight-page report from an industry consultant provides the level of confidence required.� I appreciate that Gemmell’s study is a few years old, but he is undoubtedly independent and is retained by national governments to advise them.� He was CEO of the EPA here and I would prefer his views over industry consultants." Three officials from the Department of Energy and Mining will be on site throughout the pre-commercial demonstration trial, which is expected to take two to three months. The company has now decided to use the gas for the production of urea, for fertiliser, and ammonia, which has a range of industrial applications including explosives, mineral processing and chemicals manufacturing. Adelaide Independent Reporter �www.theair.com.au�is licensed under a�Creative Commons Attribution-NonCommercial-NoDerivs 3.0 Unported License.